BALTIMORE, March 14, 2019 /PRNewswire/ — Doubling the low amount of total body radiation delivered to patients undergoing bone marrow transplants with donor cells that are only “half-matched” increased the rate of engraftment from only about 50 percent to nearly 100 percent, according to a new study by Johns Hopkins researchers. The findings, published online Mar. 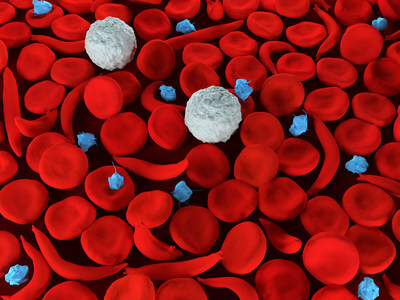 13 in The Lancet Haematology, could offer a significantly higher chance of a cure for patients with severe and deadly inherited blood disorders including sickle cell anemia and beta thalassemia. In the late 1980s, explain study leaders Javier Bolaños-Meade, M.D., associate professor of oncology at the Sidney Kimmel Comprehensive Cancer Center, and Brodsky, researchers discovered that bone marrow transplants could potentially cure sickle cell disease, a condition with few effective treatments and one that typically kills patients in their 40s. However, this treatment has only been used sparingly since then—until recently, it required bone marrow donors and recipients to fully match each other in a set of proteins known as human leukocyte antigens that are displayed on cells. Without a complete match, Brodsky says, the recipient’s body recognizes donor cells as foreign and launches a destructive attack. Since finding a full match is difficult in this patient population—fewer than 15 percent have fully matched siblings free of the same genetic defect that causes sickle cell disease, and less than a quarter have full matches in unrelated registries—Johns Hopkins researchers developed a protocol, published in 2012, that allows patients to receive transplants from relatives who are only half-matched. This advance significantly expanded the pool of potential donors, Brodsky says, but the resulting transplants only engrafted to produce healthy new blood about 50 percent of the time. Seeking to increase the odds of engraftment for these half-matches, Bolaños-Meade and his colleagues tested a new protocol for bone marrow transplants in patients with severe sickle cell disease and beta thalassemia, two related blood disorders known as hemoglobinopathies that are caused by defects in the same beta-globin gene. They recruited 17 patients for the study: 12 with sickle cell disease and five with beta thalassemia, with a median age of 16. Each of these patients had a relative who could serve as a half-match for a bone marrow transplant. As in the previous protocol, all received doses of chemotherapy and total body irradiation to knock down their immune response to the donor bone marrow before transplant. Rather than receiving 200 centigray (cGy), the low dose of radiation delivered in the previous protocol, patients in the new study received 400 cGy—still a relatively small amount of radiation that was well-tolerated. After their transplants, all received a dose of cyclophosphamide, a drug that has proved critical to avoiding a potentially deadly condition known as graft versus host disease that is particularly prevalent with half-matches. Over the next 30, 60, 180 and 360 days, and yearly after that, the researchers tested the patients’ blood for chimerism, the amount of DNA present from their donors that signals that a successful engraftment has taken place. They found that all the patients, except one with sickle cell disease, had successfully engrafted. Although five developed graft versus host disease, the condition resolved in each of these patients. At the time of the study’s publication, only three patients still needed to take immunosuppressive medications. All of those with successful engraftment had either extreme reduction or no symptoms of their disease—the sickle cell disease patients no longer had the pain crises that are hallmarks of their condition. Similarly, the beta thalassemia patients were no longer dependent on blood transfusions. “These latest findings add to an extensive and growing body of evidence supporting the safety and effectiveness of half-matched bone marrow transplants,” says Richard Jones, M.D., director of the Kimmel Cancer Center bone marrow transplant program. “We have performed more than 1,000 half-matched bone marrow transplants, and our clinical studies have proved so successful, with safety and toxicity comparable to matched transplants, that half-identical transplants must be made available to more patients as a curative option.” Only mild, low-dose therapy is needed to allow the transplant to take—this makes the transplant potentially safer for patients with sickle cell disease and thalassemia who are often unable to tolerate the high-dose (myeloablative) therapy needed for gene therapies to take, Jones says.